In January 2013, Factum Arte were commissioned by the Mappa Mundi Trust to carry out the first high-resolution 3D scan of the ancient manuscript they are dedicated to protecting; The Hereford Mappa Mundi: the largest medieval map ever known to exist. 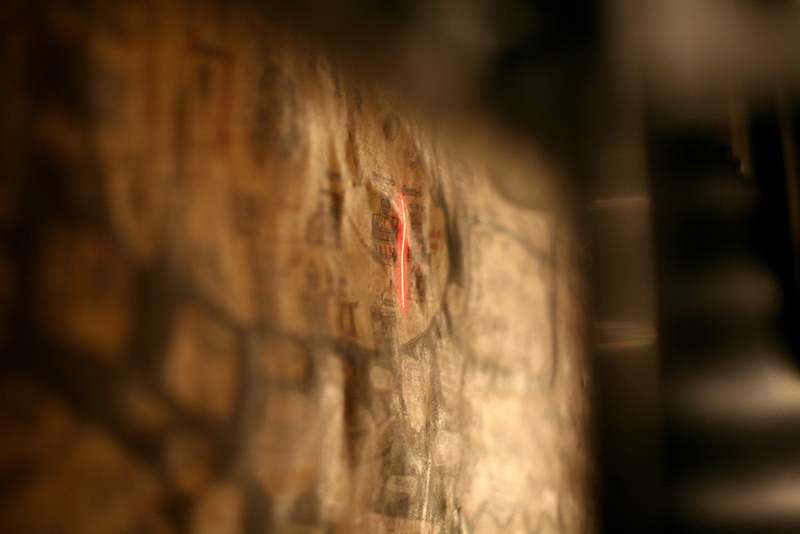 The fragile surface of this unique map, whose sealed glass cover is only removed once biennially for inspection and maintenance, was recorded using Factum’s Lucida 3D Scanner to obtain detailed information of its shape and texture. Created and developed through a collaboration between artist and engineer Manuel Franquelo and the the Factum Foundation, and built by Factum Arte under his guidance, the Lucida is a non-contact high-resolution system designed to capture even the most minute 3D information from the surface of paintings, maps, and other artifacts with shallow surface relief. 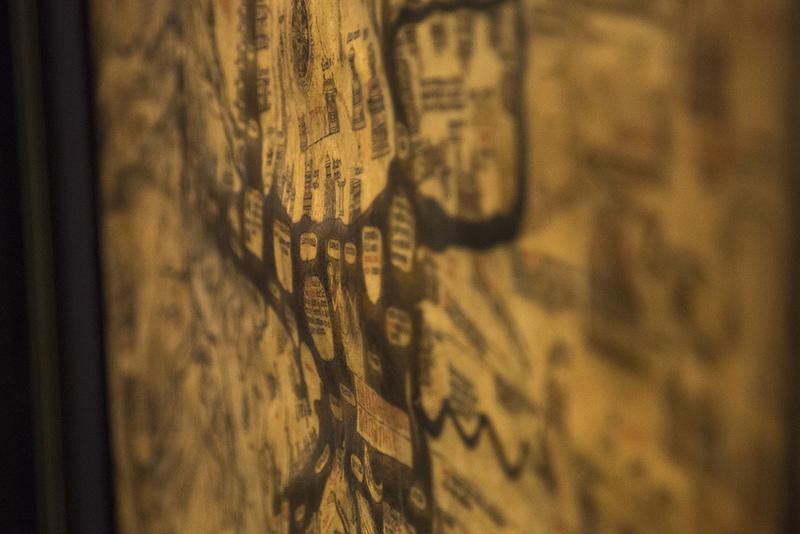 The resultant data is not only essential to understanding the Mappa Mundi’s current state of conservation, but can also shed new light on the provenance and design of this mysterious piece of cartography. The Lucida 3D scanner in front of the XIII century world map. The Hereford Mappa Mundi is one of the most significant maps in the world which appears in Jerry Brotton's recently published 'A History of the World in Twelve Maps' and has been elegantly and beautifully interpreted by Paul D. A. Harvey in his 'Mappa Mundi: The Hereford World Map'. It was drawn and painted on a single vellum sheet (calf skin) towards the end of the CXIII and is attributed to 'Richard of Haldingham or Lafford' (Holdingham and Sleaford in Lincolnshire). The map is 1.58 x 1.33 metres (64" by 52"), the skin is in the shape of an upright open envelope tapered towards the top. The central map is circular, a two dimensional globe, 1.3m (52") in diameter with Jerusalem at its centre, as the medieval church saw the world. East is at the apex, where the Garden of Eden sits on the edge of the world. The map is designed in a form commonly referred to as a T & O - the oceans forming the T internally and forming the O as they surround the land mass. The Mappa Mundi was not designed to find a direction but to show the world from a spiritual and human perspective - with sometimes remarkably accurate and sometime misjudged mapping. Europe and Asia are very clear (though their labels are reversed) and strange beasts, scenes from the Bible, imagined tribes, classical mythology and the clearly defined water sources and bodies of water (the red sea is in red ink, oceans green and rivers blue) are mixed with references to landmarks and important sites. There are around 500 drawings including 420 cities and towns, 15 Biblical events, 8 mythological scenes, 32 drawings of people from various places and 33 plants, animals, and various fantastical creatures. 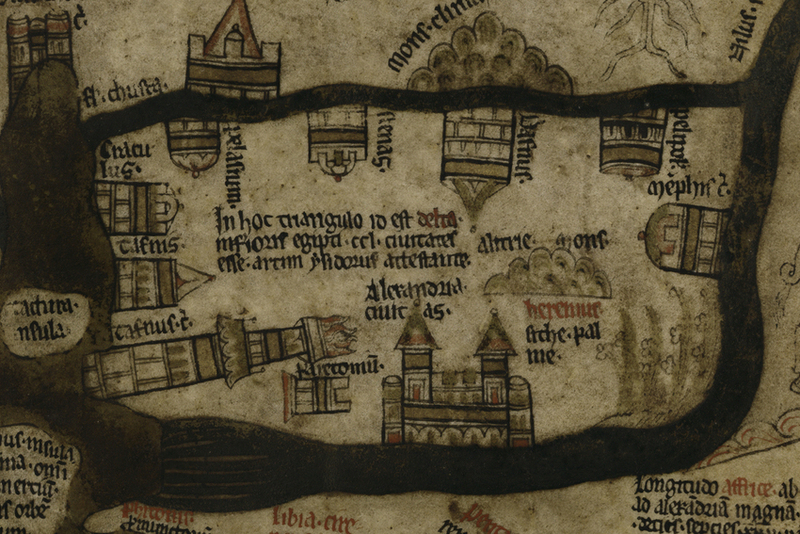 The actual structure and design of the map is similar to others of the period - such as the Psalter Map from 1262 in the British Library and the vast Ebstorf Map from around 1239, but the Mappa Mundi has intrigued scholars with its allusions, illusions and labels that are rendered beautifully. The work was completed over the two long days in the controlled environment of Hereford Cathedral's marvellous chained library (one of the few left in Europe with all the original chains in place - a very efficient medieval security system) - a chamber of which houses the Mappa Mundi. 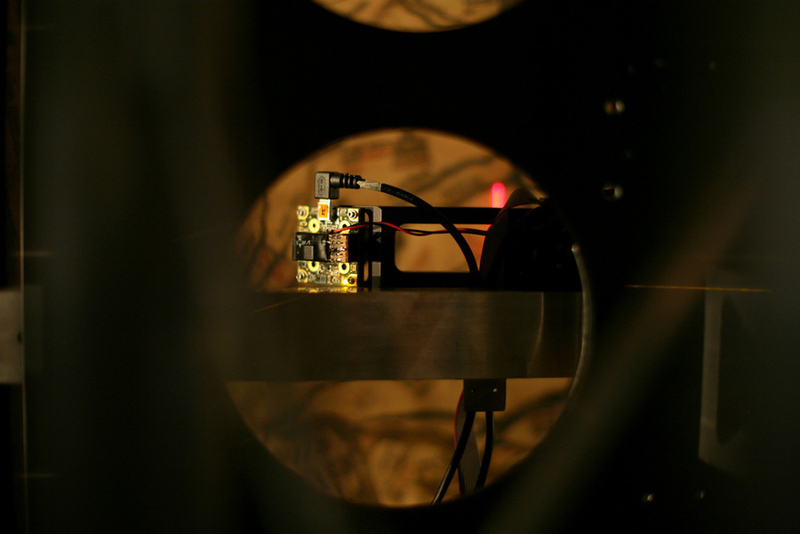 The Lucida 3D Scanner was mounted on an aluminum tower of about 2m high in order to reach the whole surface area of the map. 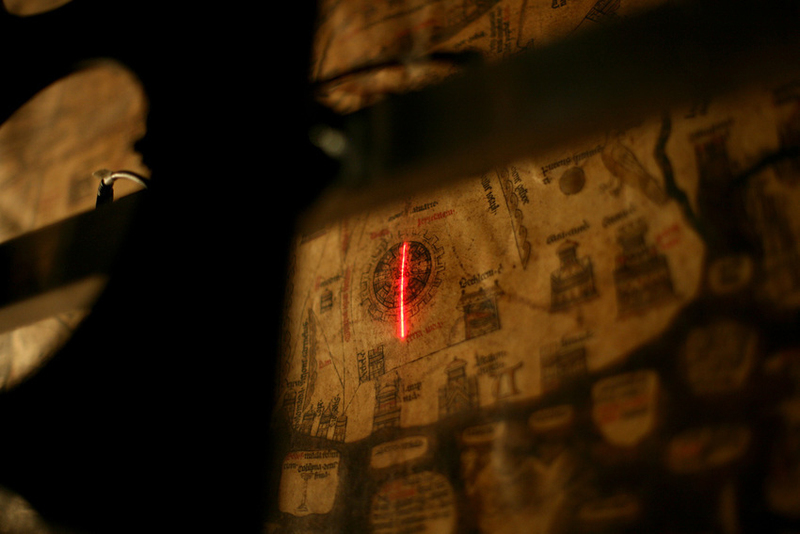 The Lucida is a triangulation laser scanner that operates at a constant distance of about 10 cm from the surface, though in the case of the Hereford Mappa Mundi the deep undulations of the vellum material required successive re-scans to be carried out at different distances in order to maintain the scanner's depth of field. The different recordings were then stitched together to form one coherent 3D model. 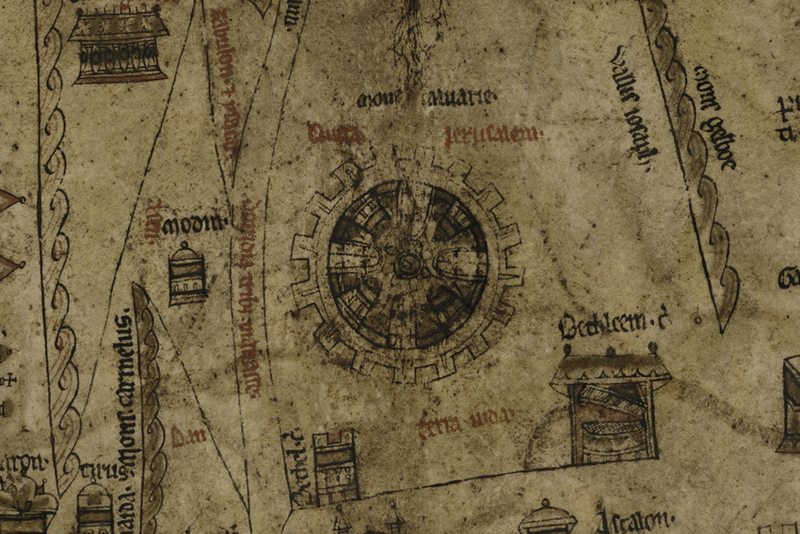 At that time, the Mappa Mundi was the largest object recorded with Lucida. Laser scanning the surface and relief of the Mappa Mundi. Lucida obtains 3D information in modular sections (tiles) of 48x48 cm, with a resolution of 100 microns. Once each tile is edited to eliminate scanning artifacts and to reduce speckle noise, they are stitched to form a single file in two formats: shaded render (8bit TIF) and gray scale depth map (32bit TIF). A high density of information points, in this case 10,000 points/cm2, is critical to 'read' an object like the Mappa Mundi in all its complexity. Not only was the general topography of the map documented with the Lucida, but also the thickness of the text and drawing, the wrinkles, scratches, pouncing marks, patches; every scar on the map's skin that define its specific character and value was captured. 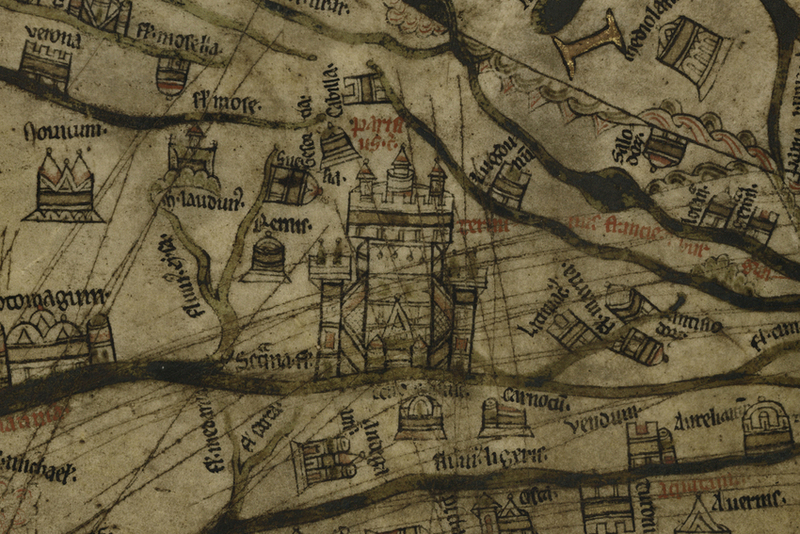 An interactive version of the image created from the data, alongside some explanation of the topography, can be found on the Hereford Cathedral website dedicated to the Mappa Mundi. 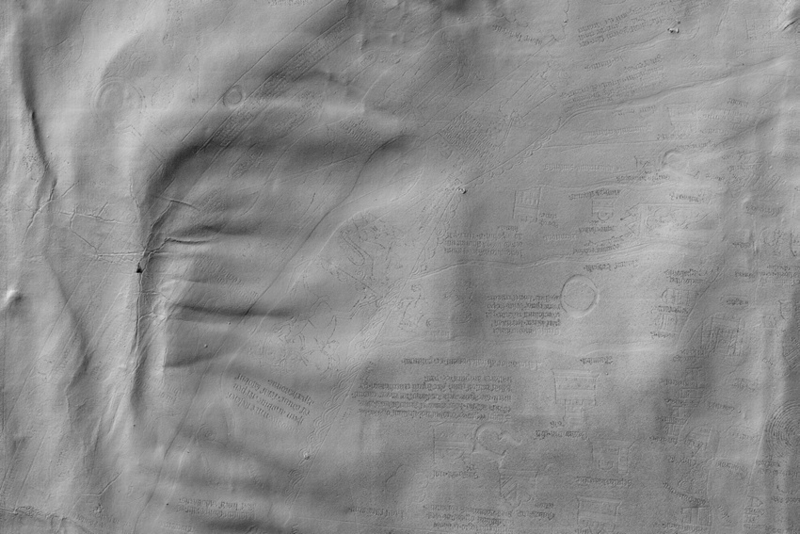 Complete rendering of the surface of the scanned map. The 3D data captured with Lucida was prototyped with CNC milling on a panel of polyurethane resin after increasing the height of the relief by a factor of 1.25 in order to make the surface details more evident. This type of transformation in the digital information are part of the mediations that are possible thanks to the original object having been recorded in the highest resolution possible. Only when the recording has been carried out with the maximum quality does the physical reproduction retain the true character of the original. The resin prototype, which was routed in two sections joined together, was then used as a positive to make a silicon mould, after which a plaster cast was produced. With this plaster reproduction, the digital information captured by the Lucida 3D Scanner has been re-materialized as a different object. 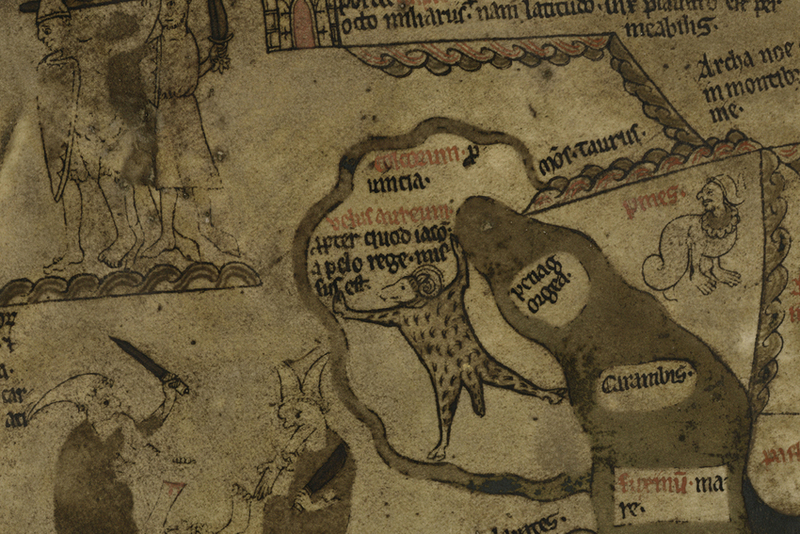 Not classed as a facsimile, as its goal is not to provide a restitution of the original, it will instead work as a re-interpretation of the medieval map. 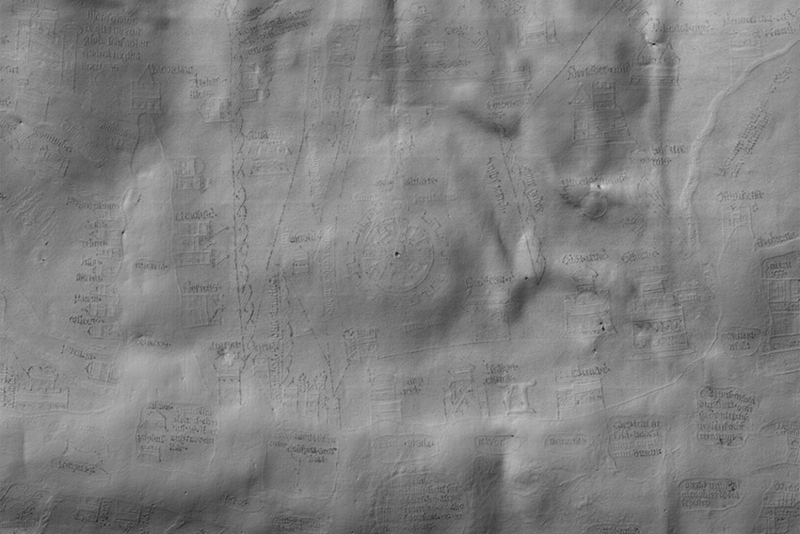 The plaster cast shows the map as a white surface in which the colour has been virtually removed, so the landscape of the ageing vellum can be clearly seen and, for the first time, touched. The 3D information being CNC routed. The plaster cast of the Mappa Mundi was given to the Hereford Cathedral in June 2013. A bespoke display-crate was designed for it, fabricated in cherry wood. The display was formed by two parts that could act both as a transport box and as a display for the plaster cast, with the surface placed horizontally. An LED stripe was also incorporated at the top to shed raking light on the surface to further highlight the relief. The plaster reproduction was presented publicly coinciding with Adam Lowe and Jerry Brotton's lecture that was part of the 2013 Hay Festival at Hay-on-Wye. After the event it was installed in the Hereford Cathedral near the original map, so visitors could directly compare both objects: the original map behind the glass protection and the plaster re-materialization with which they can interact, providing access to this wonderful artifact for the blind and partially sighted for the first time; coincidentally the College of the Royal National Institute for the Blind is based in Hereford. In January 2016, three years after the 3D recording of the Mappa Mundi, a team from Factum Arte, supported by Factum Foundation, returned to the Hereford Cathedral to carry out the second part of this unique documentation project: recording the colour of the map and scanning the surface of the wooden backboard on which it may have been drawn. The colour of the Mappa Mundi was recorded using composite photography, a process that involves taking hundreds of high-resolution macro photographs from a set of two specific angles. These individual shots are then stitched together and lens distortions are corrected to produce a single gigapixel image of the Mappa Mundi in its current state of conservation. This resultant image stands as a valuable source of information for researchers, conservators and the general public. The recording of the backboard's central flat area with Lucida, an area of approximately 156x140 cm, took about 12 hours. Thanks to this scan it is possible to have a 3D model with all the surface details for the first time. The obtained information can be employed for viewing the backboard's features, especially useful to put in relation with those present in the map's surface (digitized in 2013), and also for measuring heights and for reproduction. With the high resolution relief information obtained with the Lucida 3D Scanner of the map in 2013 and the backboard in 2016, it is possible to carry out a direct comparison between them, in order to find common features that are present in both surfaces. Due to the extreme distortion that presents the vellum it is not straightforward to register on layer on top of the other without deforming too much the data. But it is possible to allocate specific details, mainly: a) the main pouncing mark at the centre of the map (Jerusalem) and b) a series of damaged areas that coincide with points where the map was fixed to the board, that are visible in both shaded renders. A closer examination would reinforce the idea that the Mappa Mundi was in fact drawn on this wooden panel, with promising historical implications. The 3D scanning of the backboard's surface was carried out with the Lucida 3D Scanner, a process that took around 12 hours. The Lucida system has been evolving since it was first used to record the Mappa Mundi: the overall structure supporting the scanning head is more precise and robust and the software's user interface is more intuitive and easy-to-use. The scan of the backboard will hopefully establish a direct relationship between the ‘features’ on the Mappa Mundi and those on the oak boards. There is clear evidence of the compass point in the centre of Jerusalem, the centre of the map. If other points, like the centre of the labyrinth at Knossos in Crete can also be registered it could indicate that the map and the backboard belong together. Dendrochronology tests have indicated that the wood from which the backboard is made originates from trees that grew in the Hereford area that were cut in 1295 AD. While the flat surface of the backboard was recorded with Lucida, the carved border and edges were documented using photogrammetry. Photogrammetry is a method for obtaining 3D information of an object by taking multiple photographs from a variety of different points of view. This technique is especially suited for volumetric shapes where the Lucida cannot be of use due to a limitations in depth of field. 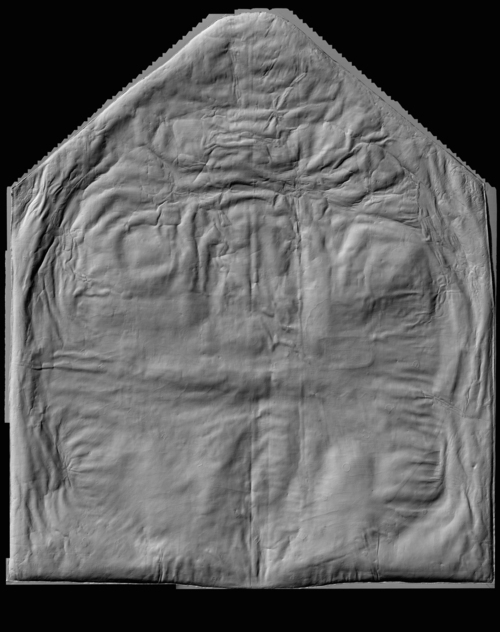 The 3D information of the central flat area obtained with Lucida had to be digitally merged with the 3D information of the edges and top ornaments recorded with photogrammetry. A first attempt to do this was done with the software Z Brush. In order to do that it is necessary to have both data sets in similar file formats (in this case STL), so the combination can be made possible. The resulting model will show different levels of details between the two digitizing techniques. 3D modelling software makes possible today to work with tonal information as relief, and vice versa. In order to overcome the problem of varying resolution levels, Factum Arte's 3D specialist Irene Gaumé tried fusing the colour information obtained from the photogrammetric recording as a way of adding a higher level of detail to specific areas of the backboard. 2D information was used as a way to recreate 3D features as part of a digital artisan approach to the documentation of cultural heritage. A different approach was implemented in 2017 by using a type of GIS software called Global Mapper. In this case each of the data sets of the backboard (Lucida and photogrammetry) were merged as grayscale depth maps. As with the alternative method, the result is an integrated model that combines the information of the flat surface with the volumetric decorations of the backboard's edge. The act of recording an original artifact is based on objectivity. But every step in the process is conditioned by different factors like the limitations of the technology (hardware and software), limitations of access to every angle of the object, difficulties caused by the material, etc. that oblige to make constant subjective decisions. How to complete areas that are missing or how to join data from different recordings are just two typical tasks that the digital artisan faces. These operations are valid within a historical preservation context as long as the original (raw) files are archived safely and each step is properly documented, so it can be traced back. While archiving unprocessed information is essential for documentation and research, 3D modeling operations are necessary for any physical or virtual output that requires a coherent result. 3) and the carved decorative parts at the top were 3D-printed in 8 pieces. The flat area, with an overall height difference of about 15 mm, was reproduced by Océ - A Canon Company through their Elevated Printing technology. 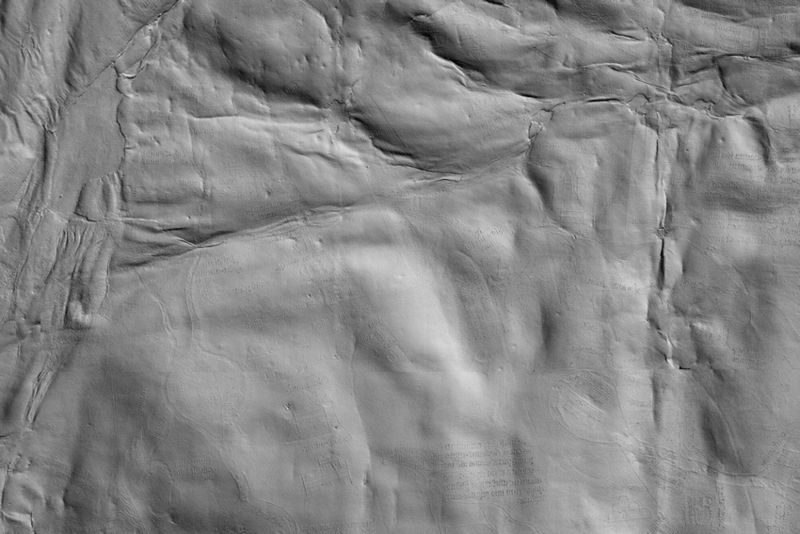 This white relief surface, that contains every detail that was captured by digital recording, could be used to make a mould and then cast in a different material. In the case of this facsimile it was finally decided to opt for a CNC-milled reproduction. The reason behind digitising the backboard is twofold. On one hand, the obtained data will be essential for understanding the historic trajectory of the Mappa Mundi. The digital documentation can be compared with that of the map itself and help historians and cartographers to establish new, unforeseen relationships. On the other hand, the 3D data of the backboard formed the base for the production of a physical facsimile to go alongside the reproduction of the map. Both reproductions will be given to the Hereford Cathedral as a donation from the Factum Foundation. 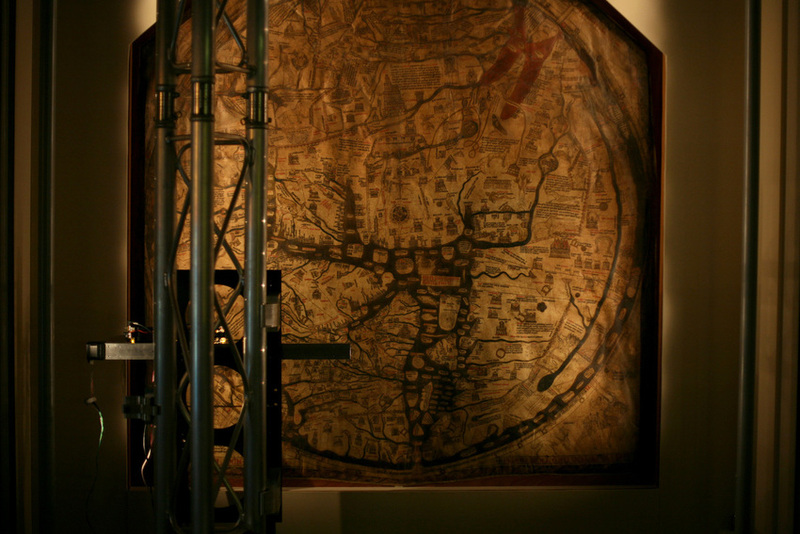 Video summarising the scanning of the Hereford Mappa Mundi in 2013. Run by Tony Campbell, former Head of Maps at the BL. Run by Peter van der Krogt. Created and developed by the artist Manuel Franquelo, cofounder of Factum Arte. Manuel Franquelo: general concept and development in the areas of electronics, mechanics, optics, and software. Built and tested in Factum Arte by Carlos Bayod, Jorge Cano, Dwight Perry, Nicolás Díez and Manuel Franquelo Jr. under the supervision of Manuel Franquelo.